Tablescape designed with help from my friends at Dish Wish and Mulberry Row Floral. Be sure to check out their fabulous websites for more inspiration! Those of you who read my blog regularly know how much I am inspired by history. As the years go by, I find myself integrating more and more elements from the past into everything I do… cooking, my sense of style, the way I decorate. My mom recently gifted me with several home goods that my maternal grandmother passed down to her– dishes, linens, glasses. I’ve been using them more and more in my table decorating; these old fashioned elements connect me to my personal past, reminding me of our family’s heritage and the loving meals we’ve shared throughout the years. While looking through my grandma’s things, I came across an antique paper valentine from the early 1900’s. There was no message on it, but I’m guessing it belonged to my Great Grandma Arnold. 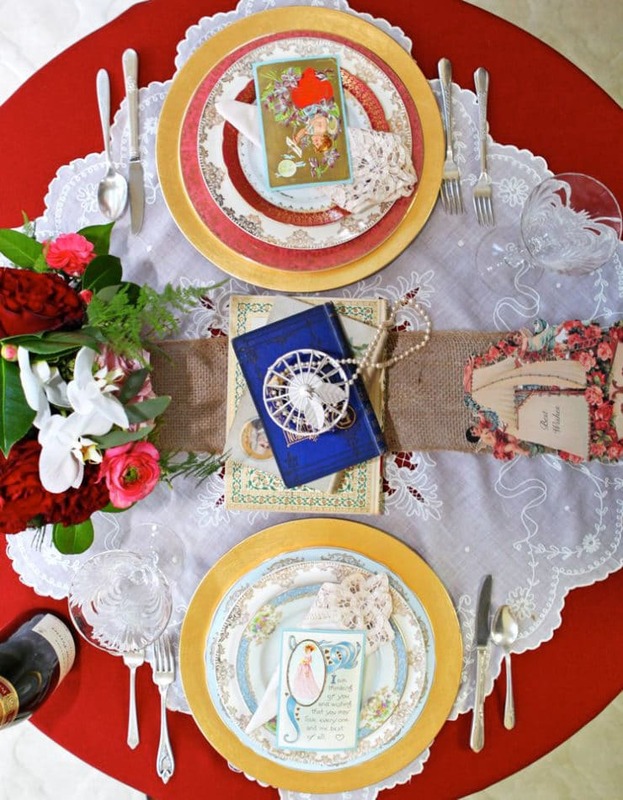 This simple item inspired me to create a Vintage Valentine’s Table for Two – a beautifully decorated table integrating romantic pieces from the past. I had several elements I wanted to incorporate into the table, like my grandma’s swirly flute glasses and her lace table topper, but I needed some feminine romantic-looking antique dishes to enhance the look. I approached a local company called Dish Wish, owned by a talented woman named Laura. She’s been collecting vintage dishes for many years, and at one point decided to turn her passion into a business. She now rents out vintage mismatched dish sets to people who want to capture that antique or retro look, from weddings to parties to brunches and more. Laura did not let me down. She put together two beautiful mismatched sets of dishes that worked together perfectly. The key with mixing and matching old dishes is color palette – making sure that all of the dishes have unifying colors within them, particularly around the rims. 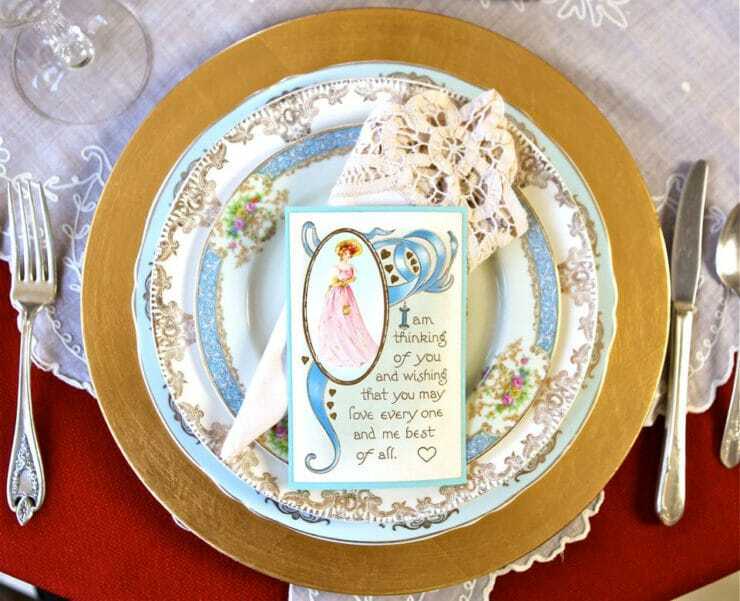 For these two sets of dishes, a “his” and a “hers,” I used two antique valentines as inspiration. We chose bright pink and pale blue as our two anchor palettes, with gold accents to bring everything together harmoniously. When placed on top of matching gold chargers, these two mismatched sets went together just beautifully. Laura lent me two lacy napkins and some vintage floral silverware for a lovely feminine finish. 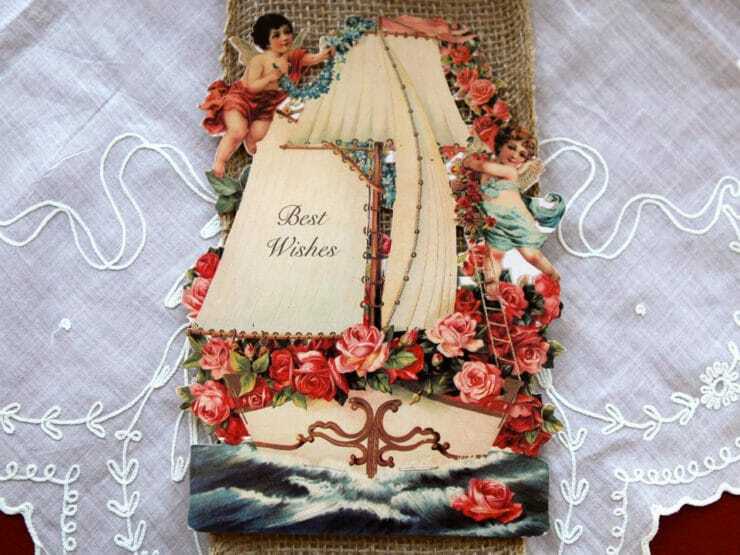 Antique valentines were the main source of inspiration here. 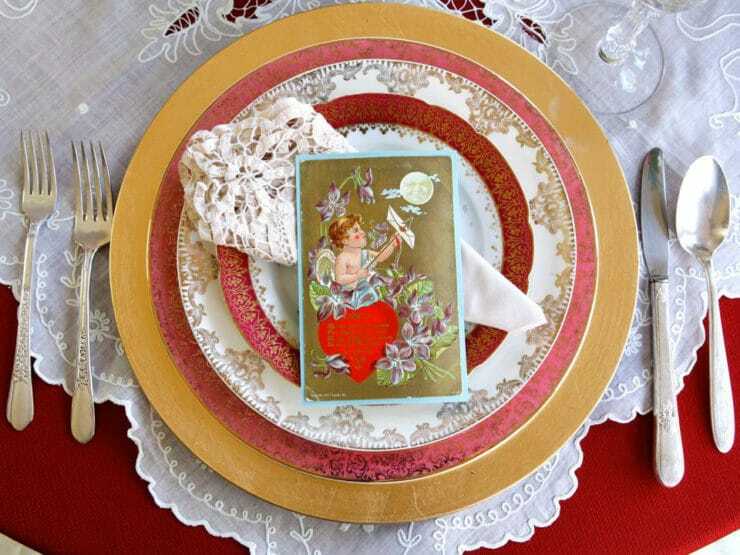 Believe it or not, you can find beautiful old valentines at most antique stores for very little money– sometimes as little as $1 apiece. You may sometimes find blank ones with no writing on the back, which means you can write your own message on them to personalize. If it’s filled out, as is often the case, you can matte the valentine onto a pretty piece of linen paper with a thin layer of Mod Podge and a paint brush. In the 20’s and 30’s it was fashionable to give valentines that doubled as table decorations with little cardboard stands attached. I found one of these large valentines at a local antique store and added it to the table… it was too distracting standing up, but laying it down on the tabletop made for a nice little flourish. Mulberry Row Floral designed a sweet arrangement for the table. They used a pretty vintage marble pedestal for the flowers and included a lovely combination of flowers, mixing various shades of pink and red together with feathery ferns and lots of greenery. It worked perfectly on the tabletop, which I covered with a red tablecloth, a lace topper that my grandma embroidered, and a simple burlap runner. I placed the arrangement on top of an antique book to give it more height and prominence on the table. 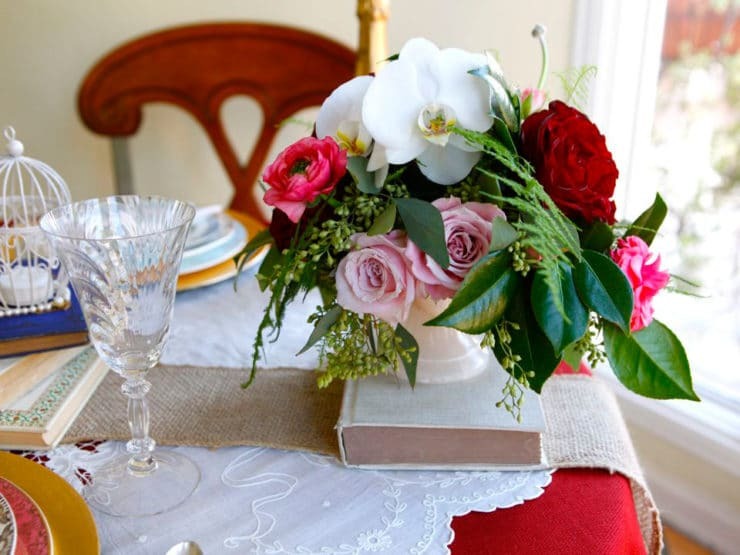 As a centerpiece, I used antique books of love poetry and short stories. 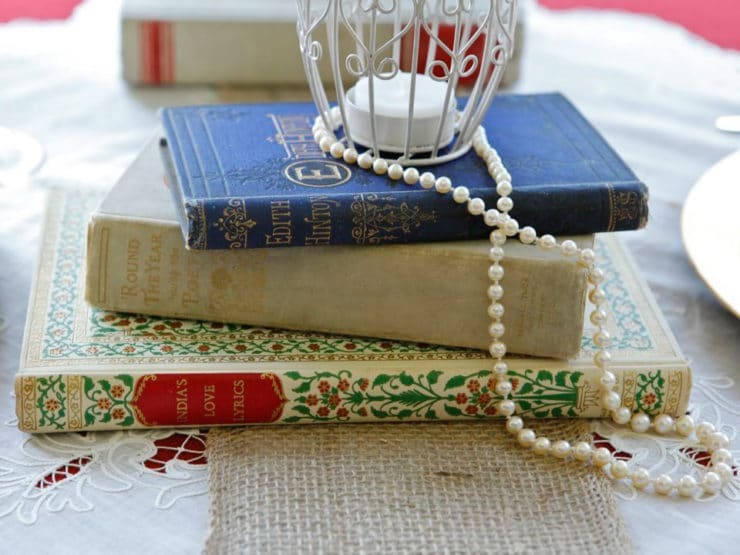 If you were decorating the table for a loved one, you could use books that are significant to you as a couple. On top I placed a small birdcage-style candle holder and draped the books with my paternal grandmother’s pearl necklace. I love including those simple elements that remind me of the people I love. Overall it made for a lovely Vintage Valentine’s Table for Two. This kind of tablescape is easy to put together and it gives a meal such a warm, personal touch. Do you enjoy decorating with antiques as much as I do? Very elegant table settings. My husband and I also celebrate our love daily. Yes, i do and for each shabbat, too. I love to utilize items from our family, from long ago and i do shop for antiques! love to incorporate into our life style. Just lovely. love this idea, I should start using my vintage stuff instead of letting it sit on a shelf ! Oh yes I do on holidays!